Booking into 2020!! Sip in the Seattle skyline from the outdoor deck perched over the walk-out basement, wander through the wrap around front walkway with beautiful landscaping or just lounge out in the backyard near the patio. This sought-after peaceful location is just a couple miles from downtown Bainbridge Island and the Seattle-BI ferry. Northwestern high-bank waterfront view~the Beach House is centered across the Puget Sound from downtown Seattle, sweeping to the right is Mt Rainier & the tip of Wing Point! Wrap around floor to ceiling windows accented with cozy knotted pine ceilings, high wood beams and comfy furniture...ensuring you can find the perfect hide-a-way spot to relax. Prefer to enjoy the sun? Lounge out on the lush green lawn. Inside you'll find beautiful high ceilings with knotted pine ceilings, fireplaces for those rainy days that need a little warming up and every room containing tasteful northwest decor to enjoy. Indulge in beautiful views of the water, the emerald city and Mt. Rainier from the basement windows all the way up to the master bedroom, living room and kitchen! The Beach House ensures even cooking dinner includes a a panoramic view! The details of the Beach house make its guests feel cozy and at home. Following dinner preparations in a chef's style kitchen, you and your guests can dine with beautiful panoramic views from the kitchen or outdoor deck. 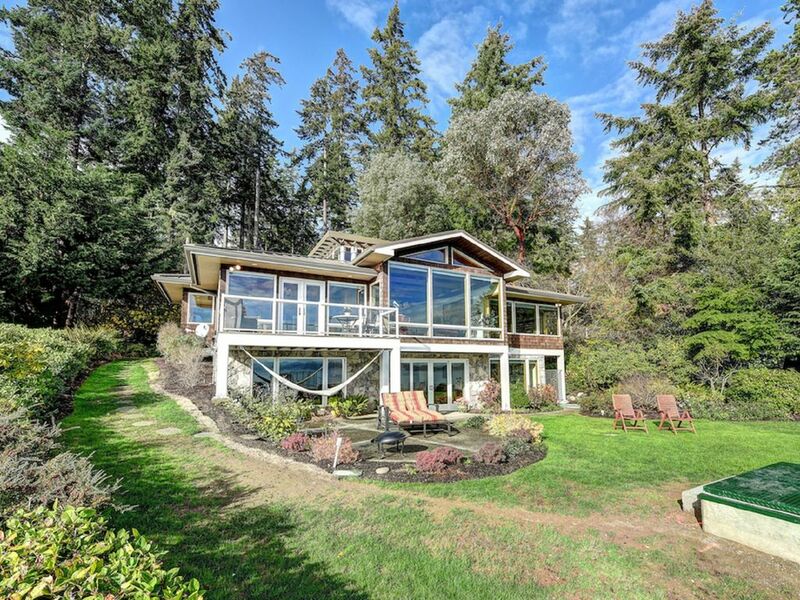 As owners, we almost tear up each year we have to leave and promise you'll fall just as in love with the Beach House and the wonderful Bainbridge Island area! The view of Seattle and Mt. Rainier stole our hearts during our dating years and we just never tire of the area. It's heaven on earth for nature lovers! We hope to someday retire on BI and spend every minute here! In the meantime, we enjoy sharing this wonderful peaceful home with fellow vacationers. Secluded enough to provide a peaceful and rejuvenating vacation yet with the conveniences of being only minutes from downtown BI and the Seattle ferry you won't be disappointed. The view is unforgettable! Sitting on over an acre, the Beach House has plenty of room for outdoor play and exercise for little ones or you can just enjoy each other's company lounging on the outdoor deck while enjoying the view of the Seattle skyline, Puget Sound traffic, the Cascades and Mt. Rainier. If you're lucky, you'll even see the whales passing through! toilet, tub, shower, Beautiful door-less shower with large soaking tub adjacent. toilet, shower, 2 room in basement on each side of this bathroom-Great4Kids! toilet, shower, On main floor off game room-great for max occupancy reserv. Enjoy hearing the high tide waves crash against the beach while sitting on lush green backyard or outdoor deck perched over the walk out basement. Absolutely stunning views of Mt. Rainier and the Cascades from the backyard, the deck perched over the walk-out basement or even when cooking in the kitchen! The Beach House features a beautiful view of the Seattle skyline (directly across the Puget Sound). Beautiful by day & breathtaking at night when the skyline sparkles like diamonds across the water! The Beach House is a high bank oceanfront property. There is beach access at Hawley Cove Park or BI Waterfront Park in town - both only a mile or two away - but not directly from the property. Breathtaking view of the Puget Sound from the outdoor deck or while lounging inside with wrap around floor to ceiling windows in the living room . Views also of Mt. Rainier and the Cascade Mountains. 1-2 cars could park outside 3 car garage. 3 car garage with automatic garage doors. Available for use during your stay. Double oven available for use during your stay. Available for use during your stay. Complimentary coffee and creamer ready for your arrival! Guests must provide all pantry items. Dining table seats 8 guests and high bar with cushion adjustable bar stools has 3 additional place setting. PS3 included with basement TV. PS3 plays your favorite DVD's or you can login to your Netflix app, etc. to stream your favorite movies! There is a winding sidewalk to the front door. There is also a sloping side yard area that allows for wheelchair access to the backyard. The master suite is located on the main floor that allows for access to the master room and bathroom suite without use of stairs to basement. The owners of the property are very friendly and responsive. Their home is very well furnished and decorated. We enjoyed our stay in the beautiful home and million dollar view! Beautiful home and beautiful location! We spent the Thanksgiving holiday with our family at the Beach House and thoroughly enjoyed all aspects of the home and surroundings. We loved watching the eagles and sea life right outside the large view windows! Great communication and smooth check in and out. We would definitely return to this fantastic home. The property was beautiful and well maintained. You cannot beat the view and the location. Michelle was very helpful and answered any question we had quickly. The property was in a great location so we could get to all we needed and spend time relaxing around the island. I would recommend this property to anyone. The views are breathtaking. I had friends visiting from the east coast - one of them had never been to the Northwest. If you want to make that first impression a special one, this home showcases the natural beauty and wonder that is Washington state. I plan on returning with other visitors. Highly recommend. Visiting for the first time from TX to Bainbridge Island this house was perfect for a family of 4 (2 small kids). The house was in great shape and the owners were very helpful if we had any questions during our stay. It is approximately 10 minute drive from the ferry terminal. We rented bikes and the house is in a good location for biking. There is no beach access so we went to a few of the public beaches (typical Puget Sound beaches; rocky not sand). A Safeway grocery is about 5 minutes away from house. Would definitely recommend this place if you're looking to come to Bainbridge to relax and enjoy a wonderful view of the Sound and Seattle. Also plenty of entertainment areas for the kiddos (theatre room, toys & games in the house). We enjoyed the house and surrounding area. We really appreciated the diligence of the owner. They were very communicative. Enjoy a peaceful walk down madrona drive (featured in 'Walks on Bainbridge' by Dave and Alice Shorett!) or take in the breathtaking water and mountain views from the 2nd story deck, the Beach House provides a peaceful and rejuvenating get away for couples or families. Just minutes from the Bainbridge ferry and downtown Bainbridge, fine dinners, shopping, outings with little ones to the park or water are endless. Heart and Soul, a wonderful pottery shop that provides endless fun times of pottery painting or fusing glass with little ones, also provides a parent's night out opportunity on select Saturdays. Our favorite restaurants include Cafe Nola, Hitchcock's and Streamliner Cafe. Westside Pizza is great for a pizza night delivery! Rates are subject to change until the reservation is confirmed. No booking is guaranteed until payment is confirmed.